Joshua Michael Homme aka Josh Homme, founder and only continuous member of the rock band Queens of the Stone Age performed with Fionna Apple, Ryan Adams, Metallica and Foo Fighters contributing to the star studded tribute to the five-hour event, officially dubbed “I Am the Highway: A Tribute to Chris Cornell”. 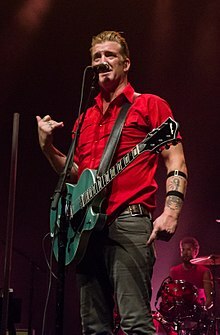 Of all the videos available on YouTube from the concert, Josh Homme’s video of his take on Johnny Cash’s version of “Rusty Cage" (originally written by Chris Cornell for Soundgarden’s Badmotorfinger released in 1992), felt like the best rendition ever. The American genre-defying rocker Homme, belted out the song just on his electric guitar and sang his heart out for Chris.